What's For Lunch every Wednesday is on. @Indonesia Eats : hahaha PB is cute nickname for him :D Thanks a lot Pep! So lucky your girl likes spicy! I hope my kids get there someday. So cute twin bears! @sherimiya : I have been waiting for this moment hehehe ... Although have to wait for my boy too but at least I can put something spicy in my girl's bento now. You will have your turn soon ;) Thanks a lot Sheri! Lovely bento as usual! I love sambal very much too, but too bad my boy and husband can hardly take spicy food. 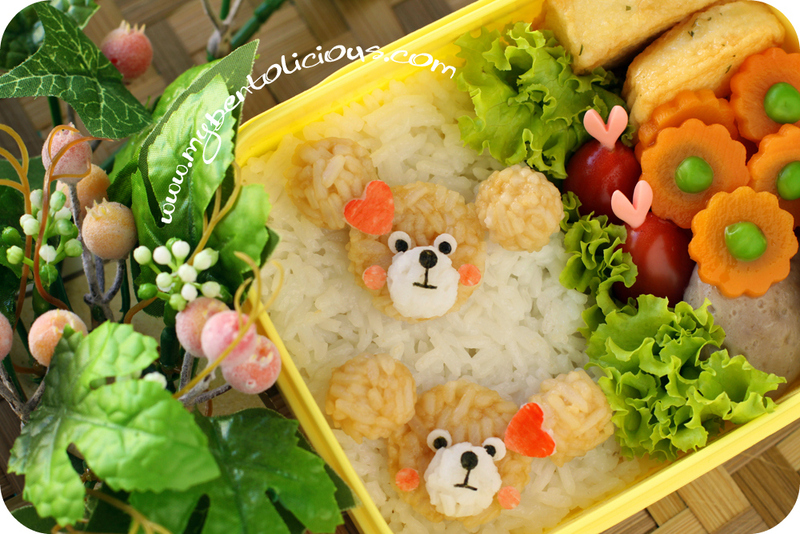 Yummy and beautiful, love the sweet bear faces in this fresh garden of a bento, Lia! Your children are so blessed with a caring and loving Mom like you:D! @OhayoBento : Thanks a lot for your sweet comment! Cute. Love the peas and carrots! Lia, your twin bears are so cute!!! Love them! @Kris : Thanks a lot Kris! Cute bento as usual and I love the carrot flowers :). cute bears! i like the peas inside the carrot flowers too. so exciting that your girl is on a spicy food kick, i'm sure that gives you more options for feeding her yummy dishes! The twin bears are so cute!! I love this whole bento box! My daughter is used to eating well seasoned food from the start. She is getting better on eating spicy but I have to tone it down a little for my husband so I do for her too.